Indicted and embattled Director General of the National Emergency Management Agency (NEMA), Mustapha Maihaja, is meting out punishment on staff of the agency who refused to cooperate with him to perpetrate fraud, forgery and embezzlement, sources in the agency have said. According to New Telegraph, the source who does not want to named for fear of being targeted by Maihaja, said the indicted DG has embarked upon punitive transfers to staffers who refused to forge, alter or backdate procurement and relief materials delivery documents to cover up his tracks. This followed his indictment by the House of Reps on fraud, misappropriation and embezzlement of the sum of N33 billion intervention fund meant for the purchase and delivery of relief materials to Internally Displaced Persons (IDPs) in the North East. The money was also to provide relief materials to communities affected by flood in 2017 in 16 states of the federation but were either not procured or diverted but money was approved and released to proxy companies associated with Maihaja. As a result of the revelations and subsequent indictment by the House of Reps, Maihaja has been making desperate efforts to cover up his tracks by doctoring documents but this met with stiff resistance from staffers who insist they won’t put their careers on the line to do any wrong. "No civil servant will risk his/her career and future to do what the DG wants us to do. That’s the truth. He is angry and once you refuse to obey his orders, he transfers you out of Abuja as a form of punishment”, a staff who does not want to named said. Some of the punitive and vindictive transfers carried out by Maihaja includes posting of Aminu Boyi Ringim, Assistant Director Accounts and Finance posted from HQ to Kaduna zonal office. Also, Waziri Aliyu an Assistant Director was also posted from HQ to Jos Zonal office. Danladi Abubakar Tanimu Chief Accountant posted from HQ to Enugu zonal office. There are many others who were moved because of their testimonies at the public hearings before the House Committee where the DG contradicted himself severally. Sources in the agency revealed that Mr. Yusuf Bassi, the Store Officer has been threatening staff to sign waybills and backdate it to 2017 or else he will forward their names to the DG for punishment. Another officer involved is Yusuf Ibbi Attah who procured and took the forged and doctored waybill from Yola office of the agency to the headquarters. 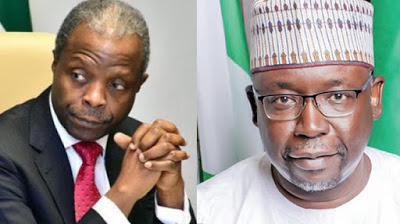 Reliable source confirmed to New Telegraph that the DG and an aide to Vice President Yemi Osinbajo have been working seriously to doctor documents but the affected states and IDPs are on the alert. "We didn’t receive any relief materials from NEMA and so we are waiting and watching to see how they will forge our papers to say we receive the items,” a senior Adamawa State government official said. “They are desperate and have been forging papers and the DG boasted that he will make security agents to deal with the suspended Officers of the Agency,” another source at the agency said. How the six companies in question got the job of about 9 billion without due process? Where is the grains? Why did it take NEMA more than six months to respond? Why is it that when the committee started investigation the agency started rushing to deliver some items? And both the 3.1 billion and 5.8 billion was withdrawn from consolidated Revenue account? Investigations revealed that NEMA uses the 20% ecological funds it receive monthly to buy food items and always divert the additional funds received while the statutory money can actually handle emergency cases as the agency does in the past. Last week, the House of Reps Committee on Emergency and Disaster Preparedness discovered another set of hidden rice meant for IDPs in a private Lagos warehouse. The rice is part of the 6,779 metric tons donated by the Chinese government for delivery to IDPs in the north east but the DG refused to deliver and allowed it to rotten in the agency’s warehouse in Gombe. Nigerians were shocked after images of the rotten rice emerged last week which attract wide condemnations. Maihaja, sources at the agency said, is moving to evacuate the wasted rice and dispose it at a time the country is facing acute shortage of food for IDPs causing malnutrition and deaths in children.